Time to make some space in my Phantom art portfolio for newer pages. 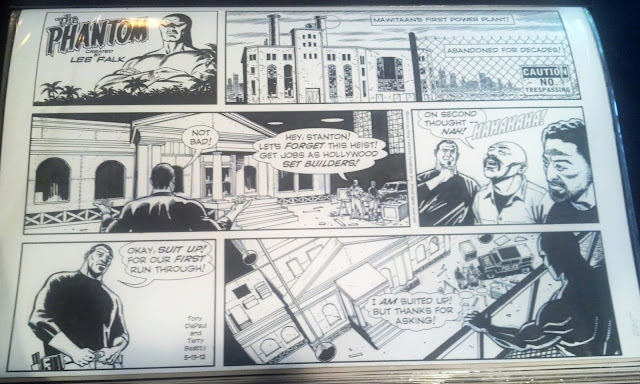 So -- here's a sale deal on what's left from the Power House Gang story. 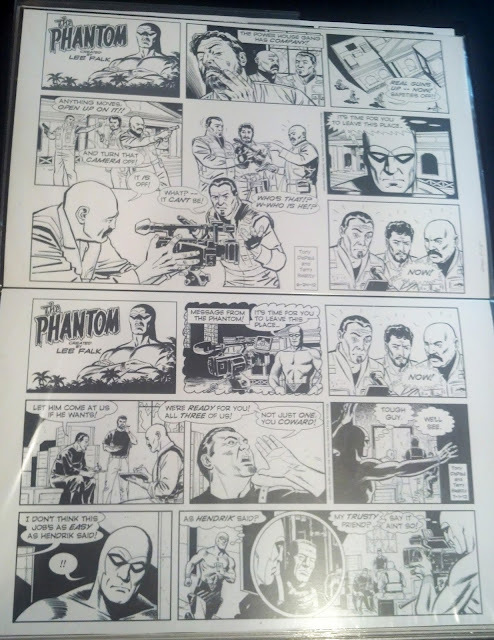 These pages were originally priced at $200.00 to $275.00 each -- and recent internet auction results show my pages holding their value at resale -- but here's the sale deal on these: any ONE page for $175.00 or TWO pages for $250.00! Price includes shipping in the US. Add $20.00 for shipping overseas (less than my actual cost). Contact me via email to reserve, check on availability, and for payment details (Paypal, please). I'll update the listing as pages sell. Glare/reflection is on the plastic sleeves in my portfolio -- not anything to do with the art. All pages are 11x17, hand inked art over blue line printed "pencils" and printed lettering. Logo panel is a print out, as well. The rest of the pages from this story are sold -- this is all that remains available. I will include a surprise extra item or two in each package, and will sign the pages, of course. Personalized if you like. Sale runs for ONE WEEK, starting today, July 29, 2013. 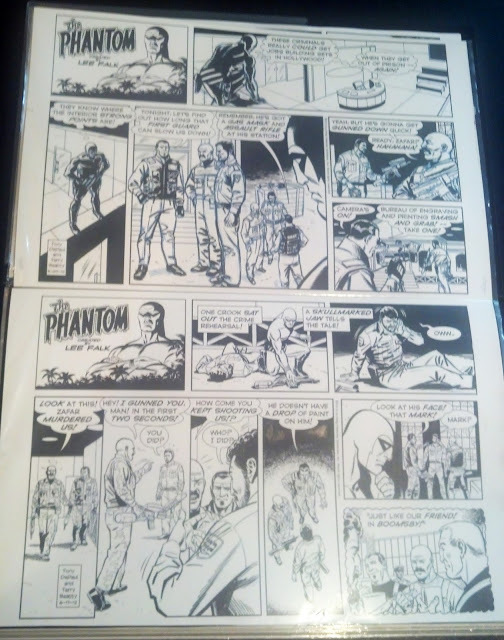 Page 5-13-12 Phantom in shadow in last panel. 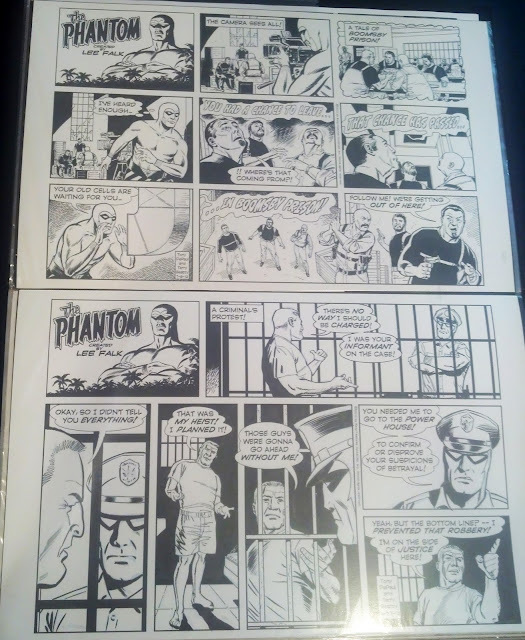 Page 5-20-12 Phantom in multiple panels -- blue line pencils printed a little heavy. Page 6-17-12 - nice Phantom profile. Page 6-24-12 Skull-marked villain, Phantom close up. 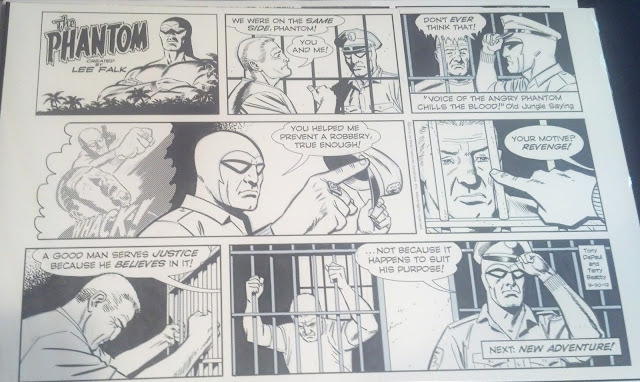 Page 7-1-12 -- top right panel and circle panel at bottom are print-outs, the rest hand inked. Lots of Phantom. Page 7-8-12 Middle panel top row is a printed out "repeat panel" -- all the rest hand inked. Page 9-23-12 Phantom in disguise! Page 9-30-12 -- final page of story. "Whack" image is a print out "repeat"-- the rest hand inked.